On the hunt for clues to past climate, he found polar bears—and they almost found him. 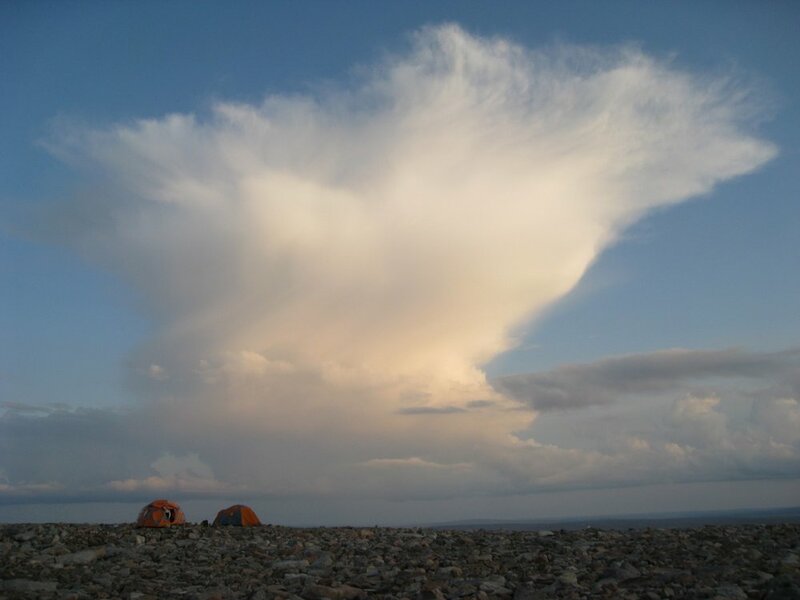 When University of Colorado PhD student Kurt Refsnider headed north last summer to collect samples for Gifford Miller’s NSF-funded paleoclimate study, he knew what to expect. He’d already spent parts of two summers exploring the remote, wind-swept reaches of Baffin Island in Canada’s High Arctic, searching for evidence of ancient glacial movement. He knew that a researcher’s best-laid plans were subject to out-of-nowhere storms or shuffling helicopter schedules. So the first few weeks of the trip he made in 2009 along with graduate student Chance Anderson proceeded largely as expected (if not exactly as planned). Outfitted with tent-camping gear and their sampling equipment, they were transported to the field by helicopter. When the weather cleared, the team moved south by helicopter to the Qivitu region. As planned, locals from the community of Qiqiktarjuak helped with logistics. Miller's team is analyzing glacial deposits (rock and sediment samples) for information about how ice sheets formed in ancient times, waxing and waning in response to climate change. A few glacial deposits in the area go back about two million years, a rare commodity in the Arctic. Back in their labs, scientists use a variety of high-tech measurements to extract information about the evolution of the ice sheet. The information should help them better understand long-term patterns in glacial erosion, test a key hypothesis for the cause of a major shift in global climate cycles that occurred around a million years ago, and lead to improvements in ice sheet models. In addition to these goals, the team was collecting samples of moss and lichen from beneath the edges of rapidly-disappearing ice caps on the interior of Baffin Island. These ice caps formed in the past few thousand years in response to climatic cooling. Due to the cold arctic climate, the ice was frozen to the landscape, leaving the old moss and lichen intact. Radiocarbon dating of this organic material provides a record of precisely when these ice caps formed, allowing Miller's team to evaluate both potential causes for and the rapidity of this cooling. The researchers spent a few nights camping, but daily sightings of polar bears—four or five sightings a day, in fact--convinced them to retreat to plan B: to use small cabins that dot the area owned by locals who use them during hunting trips. The researchers broke camp and drove the ATV to the cabin, a rudimentary structure with boarded-up windows that nevertheless felt like a safer option than the tent camp. That's ironic given what came next. 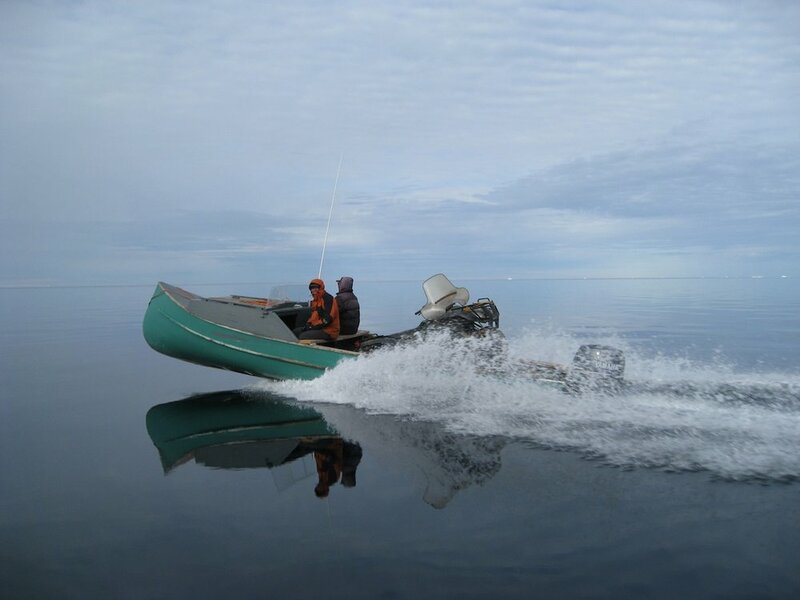 The next day, the team flagged down a passing motor canoe and returned to the safety of Qiqiktarjuak to regroup. The team will return this summer to Baffin Island to finish the sampling, but with increased precautions to limit their exposure to polar bears. They will base in Qikiqtarjuak, flying between the village and their sampling sites via helicopter, and returning at the end of the day to the safety of the small community. The helicopter will stay with them at the sampling sites. The research team will be accompanied by local guides who stand watch for bear as the team works. Refsnider says he’s recently heard from his contacts in the village. In an unprecedented turn of events, the sea ice drifted away in December. This means that it is likely the polar bears will find little sea ice on which to stage their hunt for food again this spring and summer—which may increase the likelihood that they will again approach human settlements to find food.